Evangelos Odysseas Papathanassiou (Greek: Ευάγγελος Οδυσσέας Παπαθανασίου [evˈaɲɟelos o�iˈseas papaθanaˈsiu]; born 29 March 1943), professionally known as Vangelis (/v�ŋˈɡɛlɨs/), is a Greek composer ofelectronic, progressive, ambient, jazz, pop rock, and orchestral music. He is best known for his Academy Award�winning score for the film Chariots of Fire, composing scores for the films Antarctica, Blade Runner, Missing,1492: Conquest of Paradise, and Alexander, and the use of his music in the PBS documentary Cosmos: A Personal Voyage by Carl Sagan. 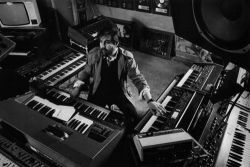 Vangelis began his professional musical career working with several popular bands of the 1960s such as The Forminx and Aphrodite's Child, with the latter's album 666 going on to be recognized as a psychedelicclassic. Throughout the 1970s, Vangelis composed music scores for several animal documentaries, including L'Apocalypse Des Animaux, La F�te sauvage and Op�ra sauvage; the success of these scores brought him into the film scoring mainstream. In the early 1980s, Vangelis formed a musical partnership with Jon Anderson, the lead singer of progressive rock band Yes, and the duo went on to release several albums together as Jon & Vangelis. In 1981, he composed the score for the Oscar-winning film Chariots of Fire, for which he won an Academy Award for Best Original Music Score. The soundtrack's single, Titles, also reached the top of the AmericanBillboard Hot 100 chart and was used as the background music at the London 2012 Olympics winners' medal presentation ceremonies.